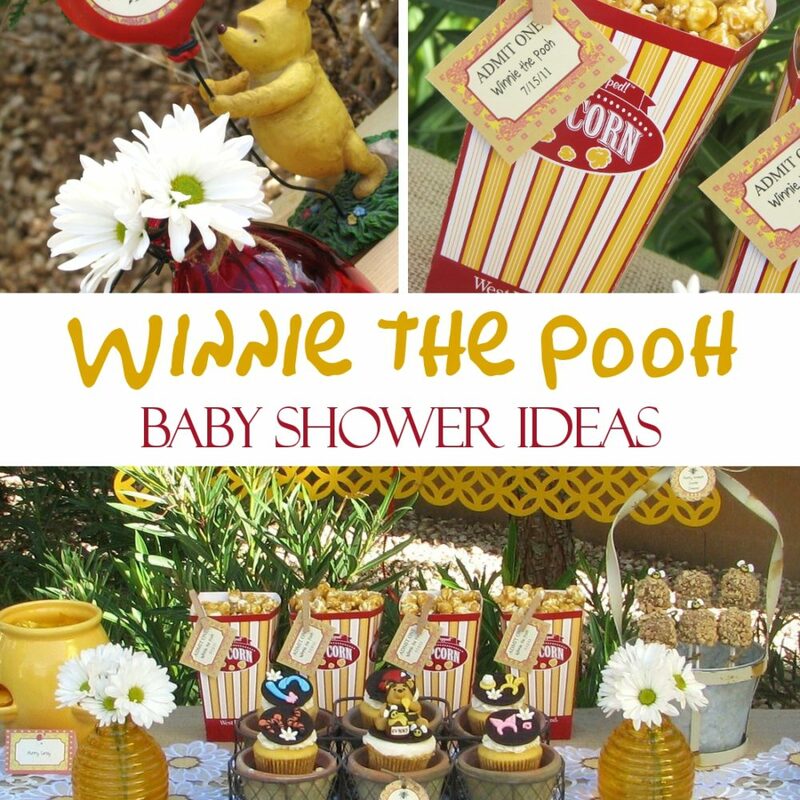 If there’s a rumbly in your tumbly, then this calls for a Winnie the Pooh baby shower! 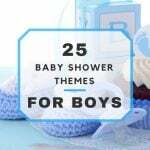 Whether or not you know the gender, get carried away by Pooh and his friends with this beautiful, gender-neutral baby shower. 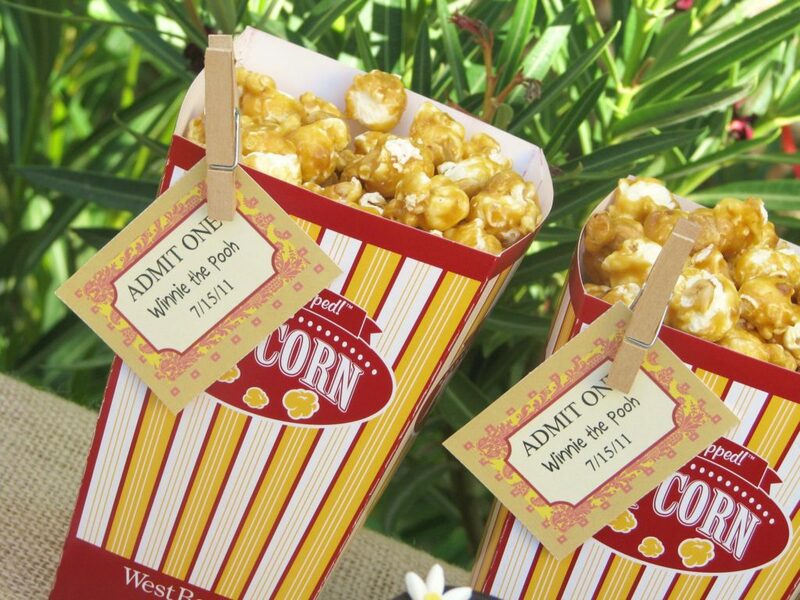 Aside from all of the characters from Winnie the Pooh, you need to have a guest list so that you can send out those Winnie the Pooh invitations! Don’t waste your money on invites at the store that everyone has already seen, though. Go for something unique for such a special occasion. By ordering the invites online from Etsy, you are supporting a small business while getting a product that’s custom made! I also include some options from Amazon at the end of this article if you’d prefer to get them there :-). Honey pots: Paint flower pots to look like honey pots from Winnie the Pooh, plant flowers in them and viola! You have beautiful room decorations or table centerpieces! Hundred Acre Wood: The home of Winnie the Pooh. 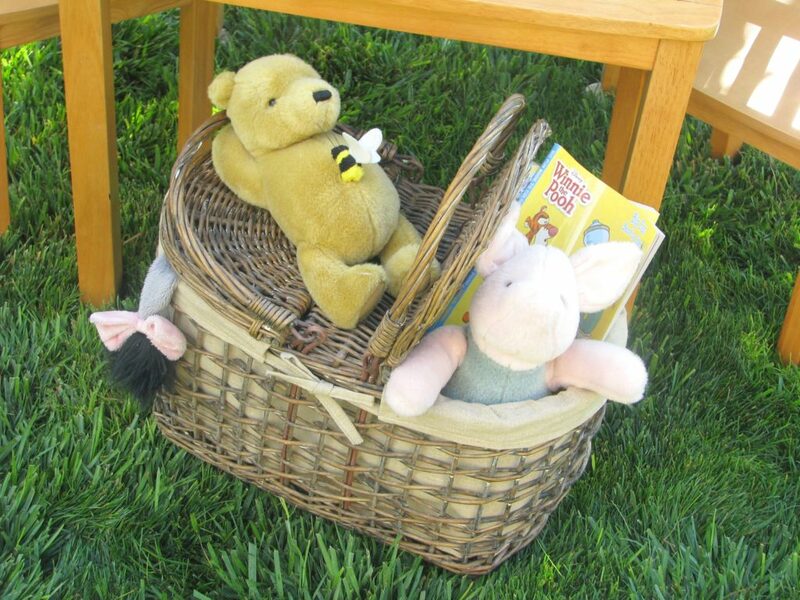 Decorate the main table, gift table, or whatever big table that will be used a lot as the Hundred Acre Wood by using tree stumps, branches, fake grass, and the characters. You can get really creative with this one; it’s a cute idea. 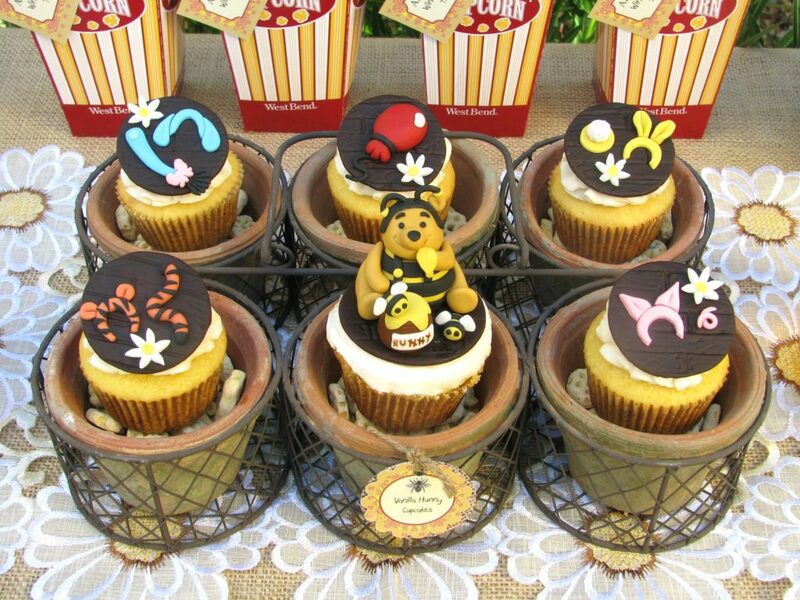 Special thanks to Lynlee’s Petite Cakes for this adorable Winnie the Pooh Baby Shower design! Winnie the Pooh Themed Food- And it’s not just hunny! Beehive cupcakes: These are any flavor cupcake that you desire, with the frosting on top decorated to look like a beehive with bees on it. 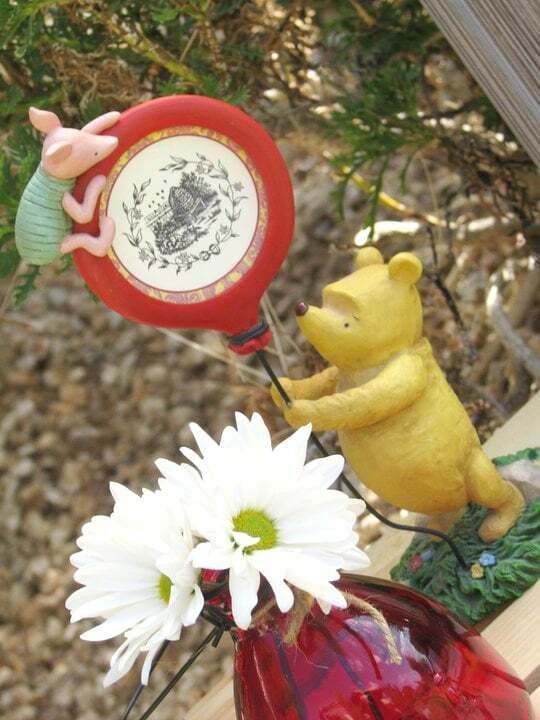 Pooh loves honey and honey is stored in hives! Tigger Tail pasta salad: This is pasta salad made with the twisted pasta so that the pasta noodles resemble tigger’s tail. You may choose to dye the pasta orange to give it more of a “Tigger-effect” or leave it as-is. Piglets in blankets: Just pigs in a blanket with a much cuter, pooh-ier name! Nothing special is required for these, other than a cute sign by the plate. Piglet’s pink punch: Every shower needs a themed drink, and this is it! Serve up any pink punch in cute, little mason jars with straws. Don’t forget to have Piglet by the drink station! When it comes to fun, the characters of Winnie the Pooh know how to do it best. 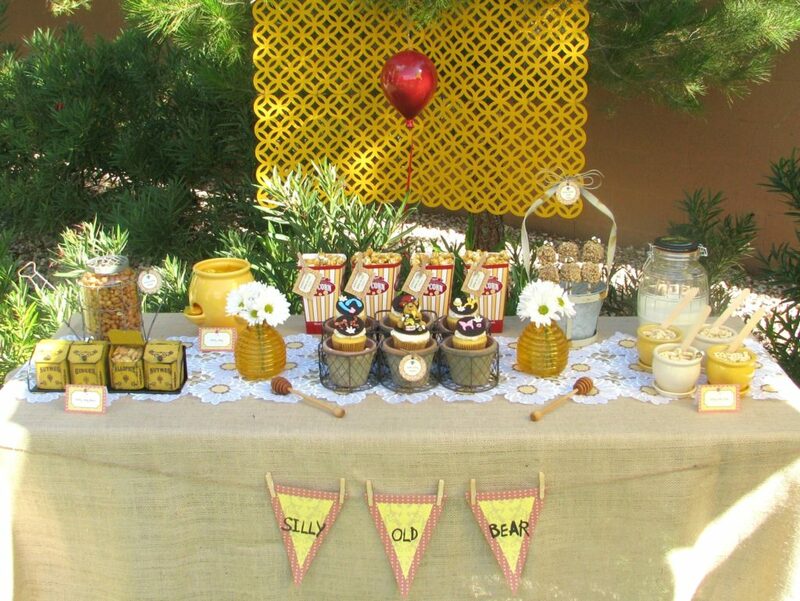 Skip the baby shower game basics and try these great ideas for a Winnie the Pooh baby shower! Find and pin the tail on Eeyore: Poor Eeyore has lost his tail again! Hide “Eeyore tails” in plain site around the room, each guest must find one, then get blindfolded and try to pin it in place on Eeyore, most likely sitting over there in the corner. Tigger’s bouncy race: This requires medium-sized yoga balls and willing participants. Basically, the contestants must compete in a bouncy race across the room! It was Winnie the Pooh who said “How lucky I am to have something that makes saying goodbye so hard.” Make it memorable with party favors. Send your guests off with a sweet thank you and goodbye by giving away those bear-shaped bottles of honey, little jars of honey, or even those wooden honey dippers! It doesn’t get much sweeter or more aPOOHpriate than honey!